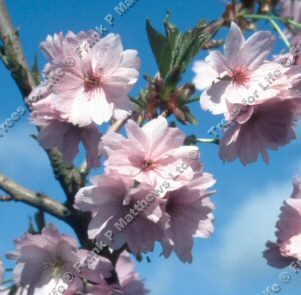 One of the most beautiful Matsumae flowering cherry varieties, Pink Parasol (Prunus ' Matsumae-hanagasa') is noted for its graceful spreading branches, which are wreathed with heavy clusters of long-stemmed blooms in late April. These large pale pink flowers have densely packed petals surrounding a centre of bright-green, leafy carpels. Pink Parasol is supplied at a height of between 1.5 and 1.7 metres in a 12 litre container for year round planting and better results than from either bare-root or rootballed stock. A medium sized tree, so expect a height of up to 6 metres (20 foot) after 10 years.